Today I'm trying two more fragrances in the Armani Privé quartet by Giorgio Armani (see yesterday's review of Pierre de Lune and Ambre Soie). Bois d'Encens is said to contain only 5 ingredients, including vetiver and two kinds of incense. I don't know what the fifth ingredient is, but the fourth is surely cedar, which dominates the opening and remains prominent throughout the dry down. As the cedar calms, the smoky incense notes begin to heat up, and there is a nice peppery-earthy undertone from the vetiver. That is the whole story: cedar-y church incense. It is very dry, and probably the most masculine of the group. It is not a complicated perfume, but then, sometimes simplicity does the trick. Pierre de Lune still strikes me as the most interesting of the quartet, but Bois d'Encens is the only one that captivated me, and the only one that I would even vaguely consider buying if I had the money. Which I don't. Eau de Jade will get less attention than the other fragrances for the simple reason that I no longer have a sample. The notes are bergamot, neroli, and bourbon vanilla. I tried it briefly earlier this year, and it struck me as a soft fresh citrus, slightly soapy, with just a hint of vanilla. It was perfectly nice, rather along the lines of one of Olivia Giacobetti's limited edition summer fragrances for L'Artisan Parfumeur. At L'Artisan prices, I would have given it a second try, but I was not immediately entranced, and as I just couldn't wrap my mind around the idea of paying $185 for a soft summer citrus, I passed my sample on to someone else. If I missed the boat on this one, do comment, although given the price perhaps I am better off remaining in ignorance. Just got back from NY and found your Armani reviews–on a w/e yet! Agree completely about the price, but the combination of the lovely bottle and my love for incense caused me to cave on Bois d'Encens during a Saks F&F event (at least it was 20% off). I must say–I'm glad I did; I wear it often during these cold days, and enjoy it thoroughly (BTW, I think the final ingredient is supposed to be pepper). Another time, some friends and I cadged some of the small samples from an SA in the Armani store–and he told us they were meant to be layered as well as worn separately. I tried Ambre Soie with my BdE and, like someone else yesterday, found them delicious together (like you and a number of others, I thought AS was thin when worn alone). I haven't tried any more combos yet (I have a Pierre de Lune sample, but not a Jade, b/c I wasn't particularly impressed it). Thanks for the reviews! Robin. I'm on the same wavelength as you! When I tried the Jade my immediate thoughts were 'What is so Prive about this one?' I would have hated for him to give me that one if I were one of his friends. I posted my comments about the Encens yesterday, it is my favourite and like you, if I had the money, I would buy it. I love incensey scents and up here in good old Yorkshire there is a certain lack of places where one can buy them from. Am an incense, cedar addict of the first order, so I wasn't surprised to fall hard for Bois d'Encens. However, I ended up really liking the Jade and that does indeed surprise me. At first I thought it seemed a nice, but unremarkable, fresh, clean scent. The dry down was where it got me, though as the vanilla became stronger and then a hay note emerged. Fatal for me. I *adore* hay notes in scents. It reminds me of Valentino's first (discontinued) scent. Not FBW, but I really would love to wear it in the spring. Wish they would come out w/ smaller bottles or follow the Hermessence example and do a Discovery Pack. I adore Eau de Jade–it is one of the few perfumes that I am SO glad I bought. I usually like the things I buy, of course, but I get tired of some perfumes too quickly. This is not one of those scents. It is quite complex under a slightly sleepy exterior. It lasts forever on me and keeps shape-shifting til the very end. Oh, and PS: I don't find Eau de Jade at all Olivia Giacobettiesque–it is quite a bit more grounded and earthier than her scents. This is one fragrance that you cannot GET from a sample–you really need to spray it on. Victoria agrees with me, after trying some from my bottle. B, I have to drive 30 minutes to buy anything more exclusive than Stetson, so I sympathize. I don't remember the hay, but that makes it sound even more like an Olivia Giacobetti. Drat, might have to try it again. L, maybe that it is, as I didn't get one of the nice Armani Prive spray samples, just a plain little ole vial. It didn't strike me as being in the least earthy. But OG can do earthy — look at Philosykos or Hiris. Not arguing that it is actually by her, mind you. I barely smelled it. I know you have good taste, so ok, will spray it on next time I'm in Barneys. I adore incense perfumes (I think you do as well, R). The Prive Encens is beautifully realized — incense at its most stark and uncompromising. I was prepared to love it. However, ultimately I found it too cold — although I agree that it would probably be lovely layered with the amber, or something spicy. For now I'll continue to waft around in my standby incense: good ol' Passage d'Enfer, or my current passion, Etro Messe de Minuit, which is …. warm, enthralling, nothing goth about it! CdeG Avignon — have you tried? Any comparison to BdeE? Oh, yeah, I see what you mean about OG. Still, even in her heavier moments, she seems very ethereal to me. EdJ isn't that at all. M, Love incense. Must argue about Messe de Minuit, which I think of as the all time, ultimate gothic scent. Admire it, but don't wear it. Adore Passage, Shaal Nur. Have not paid adequate attention to the CdG incense series — tried them all at the same time and they are jumbled together in my mind. Mean to try them again & do a proper review soon. I too found myself captivated only by the Boise d'Encens. As soon as I heard it's Armani's personal fragrance – the childhood church experience was quite obvious. Now I know it was also his intention. R, for me it's a 20 minute train journey to get to any decent perfumes. Armani Prive is 200miles south in London, not an everyday trip..tee hee. Probably just as well really, the temptation is just too far away. A, I was very surprised by the smell of plain Frankincense oil when I tried it recently. It was completely different from what I expected. Would rather have Bois d'Encens any day. Am the opposite of you: would rather have it on my skin that burn it in my home. B, sounds like we are about the same distance from civilization. Quite agree — I could not take the everyday temptation of living near a niche fragrance boutique. I would end up destitute. Also — I think living far away & doing most everything online and through the mails makes me give more consideration to a fragrance before I buy it, which is not a bad thing. Well, argue with me, then, on the Messe! I tried it reluctantly — it's revered by goth fandom as churchy in the creepiest possible way, reviled by pretty much everyone else as moldy and worse… I confess I frequently wear it to church, to me it is incense, spice and something vaguely Christmas-y — like the Caron Nuit de Noel is to other folks. Your nose is much better educated than mine — why gothic? I gotta chime in with my love for Jade as well. There's just something about it – maybe the tart green opening , leading to a richer more earthy drydown – that just makes me feel good when I wear it! M, doubt my nose is any better educated than yours. MdM doesn't even smell churchy to me. Someone said in a review somewhere that it smells like ancient papers & clothing in a trunk in an attic of an old abandoned house…and that has always stuck me as apt. There is something a little creepy about it. It is a great scent, and I need to revisit it one of these days. You too M? You guys are ganging up on me. Did you actually buy a whole bottle? I did R! and I wore some Jade today in your honor! LOL! R, I already wrote my opinion on Bois d´Encens yesterday. I have a sample of Eau de Jade, but never tried it on skin, only smelled it from a paperstripe & thought it was very citrusy with a subdued sweetness. Perhaps I should try it on my skin to get a more accurate impression! All in all I agree with you completely: I´d like the scents much more if they weren´t so expensive. I dismissed Jade pretty quickly, too, preferring the Amber and Incense scents. I like the incense and am going to try it layered with the amber. I was thinking it might be my next purchase of the line, but I'm holding out for the amethyst I heard was coming. It's rumoured to have a bit of the incense in it. I heard about this at Saks, and I must say that they knew nothing about it at Barney's when I asked the SA there for an update, so perhaps it is a phantom, but I think I'll wait. Amethyst is one of my favorite stones. Other stones I'd like to see fragrance built around are: rose quartz, crystal, garnet, and hematite. There are so many possibilities! M, buying anything that expensive is a ringing endorsement, I guess. Sigh. Will look for it. Well, do put it on skin and report back. Obviously there is wild variance here on whether it is worthy of consideration! B, Amethyst is one of my favorite stones too, so also hoping that a) the rumors are true and b) it will be something wonderful. I'll vote for Rose Quartz too. Reporting back: I´ve put it on skin & I really like it, I´m just not sure how long it lasts – I put it on about 2 hours ago & cannot smell very much of it now. It´s a fresh & sweet citrus scent, but it also has some depth, it´s a “sophisticated” citrus rather than an “ordinary” one. At the moment I don´t feel like wearig a fresh scent, but if I did, I´d consider to wear this & I´m very picky when it comes to citrus fragrances! Darling, I am so sorry for commenting so late on these Armani fragrances. Remember his debut parfum called, not surprisingly, Armani? It's been discontinued for some years, but it was lovely! Anyway, the only one of the quartet that I have tried is the Jade. It smelled faintly of an old drugstore favorite of mine from way-ay-ay back in the day, Yardley's Oh de London. What a great fragrance that was. You can't find it anywhere these days. Jade smelled like it for a few minutes, then fad-ed-ed-ed…. LOL, you will end up owning the quartet if you're not lucky! Does sound like I need to get another sample of the Jade. Drat, and double drat. R, I don't remember it at all — It would have been before I was really interested in fragrance. Yardleys Oh de London must have been considerably more economical than Eau de Jade, LOL!! You got that right! So, until further notice, I am not going to spend my money on the Jade. I'm now back from Giorgio Armani boutique, and I was pleasantly surprised to see two new Eau Cologne from the privè collection: Vetiver Babylon and Rose somthing they are called. The bottlle is clar glass instead of dark as the others and the first impression is that they are wonderful. A cost is 100E for 100ml. Vetiver is a sort of Vetiver Tonka and Chanel Allure Cologne, and the lasting power is great. You have to excuse my English and my ability of explaning the fragrance, but I have tried at least. I've heard of those 2, but haven't been able to smell them yet. Looking forward to it, and so glad to hear the Vetiver is worth smelling, thanks! I tried Bois d'Encens for the first time last summer, whilst on holidays in Spain. Two separate tests n my skin then (in very hot weather) told me this was very nice, maybe even beautiful, but not sufficiently different from Avignon, Cardinal, Un Parfum des Sens et Bois or any of a dozen other incense fragrances I already own. It certainly didn't merit spending the huge money necessary to buy it (now two hundred euro). However, an Armani boutique opened a couple of weeks ago in a local upscale department store, and I tried Bois d'Encens a couple more times. I have to say that I fell in love with it, as I really like the way it smells slightly different each time I apply it. Perhaps it's the cooler weather here, or perhaps I am simply of one mind with Robin and believe that you can never have too many incense scents. So… early Christmas present for myself. Congrats on your new bottle! I've never owned one — I love it, and also think it's sufficiently different from Avignon, etc, but can't bring myself to pay the price. Do agree the bottle is better in pictures than in real life, but I almost always think that. It was a HUGE indulgence to buy Bois d'Encens and cost much more money than I'd ever spent on a scent before. But I find Bois d'Encens immensely beautiful and place it alongside Cardinal and Avignon – in a “holy trinity” of course. Throw in Jaisalmer and Messe de Minuit and you have some of the most exquisite scents made today. You know, I think the only things I've spent that much $$ on are Hermessences, and even then, only when I was too impatient to wait for the 15 ml sizes to launch & so was buying unsniffed. So, your purchase made WAY more sense than mine! I recently found both Boise d’Encens and the Jade one in the refill bottles at Marshalls! I wouldn’t have bought these at the $185 price, but for $29.99 + tax, I snatched them up (the Jade unsniffed too). I think they were the same price as ubiquitous Paris Hilton perfumes! By the way, I love how the “Perfume Houses” tab is organized. It makes it easy to go back and check reviews of perfumes that I’ve only recently encountered. And so glad you like the PH pages. 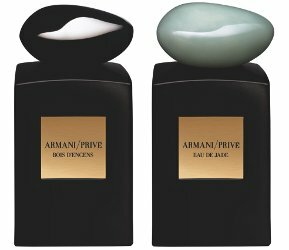 I also found some of the Armani Prive scents at TJ Maxx & Marshalls. The refill bottle for Ambre was only 19.99 and I also found the Eau de Jade full-size bottle with the cap for only 32.00! I just couldn’t pass it up! They are both lovely, although since amber is one of my favorite fragrance notes, I much prefer the Ambre scent.